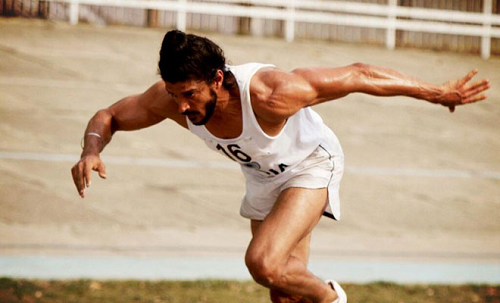 Bhag Milkha Bhag is the second biopic in the last two years which has made mark on the minds of the Indian people. The earlier one Pan Singh Tomar was equally liked and won national award. Bhag Milkha Bhag is expected to win the national award and Farhan Akhtar is also likely to win the national and many other awards for best acting. He has done very well and his sincerity is visible on the screen. Incidentally Pan Singh in real life was junior to Milkha in the Army and unfortunately went on to become a dacoit instead of a national athlete. The village of Milkha's Govindpura stands out prominently in the movie when he comes to the refugee camp at Purana Qila to register himself and also to find out if anyone else has come from Govindpura. When the character Milkha Singh utters Multan District along with the name of his village Govindpura, a wave of emotion must have surged on the faces of the people belonging to this area and who now live in India. A well of tears sprouted in my eyes too when this name came on the screen, because my mother, my father and grandfather lived in this area before trudging out to India during the partition. One is more emotional and nationalist when he is outside his country and I was watching this movie in a beautiful town of Silicon Valley of USA. One character in life which stands on the same pedestal as that of God is mother and whenever any place associated with her is mentioned, I feel like weeping loudly. Govindpura is now part of District Toba Tek Singh but before partition it was part of Muzzafargarh District. Muzzafargarh District was part of Multan Commissionerate then. But yes all people of that area speak Multani sect of Punjabi. While names of many other places in Pakistan have changed, like Montgomery became Sahiwal, Sialkote became Faisalabad, Ramki bazar became Rahimki Bazar, Toba Tek Singh was an honourable exception. Tek Singh a Sikh was reported to be serving water to the people in need during his days and a town was named in his honour. Incidentally Toba means a pool of water in Punjabi. Two of the scenes suggesting sexual act do not gel well in this national biopic. The director perhaps was carried off by the box office earnings while making this movie. One fails to understand how Milkha could have allowed these facts of private life to be shown so publicly. They appear to be fake and imaginative, but even if they were true, a cheap addition mars the mood when one is watching a film on a national character. There are many other phases of life of Milkha which could have been highlighted here like meeting his would be wife in Sri Lanka (then Ceylon) who was then captain of the national volleyball team, or how he got his shoes made from a local cobbler who charged Rs.20/- (a big amount in those days) and that too after making about 50 visits to his shop. Making of biopics is a good trend to remind the people, particularly the younger generation that this country too produced heroes who can be emulated. Milkha Singh like Paan Singh Tomar, Dhyan Chand, or Mewalal were poor but never complained about their resources and made the best of whatever little they had. It is greatness of Milkha Singh that he charged only one Rupee for sharing his life biography to be made into a movie. Will Tendulkar do so? Please note for correction The city of Lyallpur became Faisalabad after partition of Punjab. i read your article on Milkha Singh wat i nadmired is the last line of article will sachin tendulkar do it...this sets apart the real national heroes of sports from today's professional sportsmen....the zeal and the desire to represent India is one quality which makes them stand out as a true natinal champion apart from others.